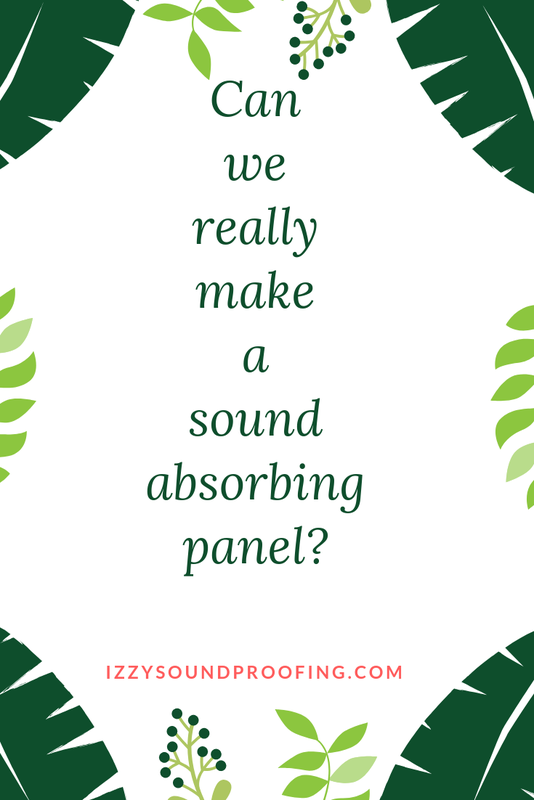 DIY Acoustic Panels: Can we REALLY make sound absorbing panel? I have been frequently asked a question, " Can we really make sound absorbing panel?". Well, the obvious answer is "YES". However, I was also a bit skeptical about the effectiveness of these panels. Frankly speaking, I haven't tried to make one until a few days back. 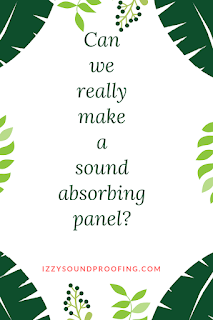 In this article, I will take you through the step by step process of making an acoustic panel which is NOT only cost-effective but also highly reliable. Moving further, you can use this acoustic panel for your home office, studio or even for the whole apartment. If you're wondering, why do you need an acoustic panel? Then, let me tell you that it is one of the best material that you can use for sound dampening, and thus protect your family against the health hazard caused by the unwanted noise. Well, have a look at this article. The important thing that I wanna discuss with you is the solution rather than the problem. We can easily soundproof our surrounding, and that too without spending tons and tons of money. Fortunately, you don't need to be well versed with the technological acquaintance. I will request you to NOT waste your time on this piece of knowledge in case, you're the one looking for the ready-made solution. There are tons of readymade acoustic panels available in the market that may serve your purpose. However, these panels come in a standard shape and size, and their performance can be a question mark if they don't fit properly in the available space. Bonus Tip: Any gap or crack can drastically reduce the performance of the soundproofing materials. The first question that I ask my client is Do you have time to invest in learning DIY skills? Being honest, most of the time, the answer is NO. So, I will recommend them some of the best panels available on the market. If you're also one among them, then you can CLICK on the aforementioned link and buy the panel from Amazon. If you're among the few who is ready to go the DIY way, then keep ready. I can assure you that this post will help you in more than one ways. For reference, we will be considering 2' * 4' as a reference. Wooden board: (1 in. x 4 in. x 8 ft. approximate measurement Strip Board): It is advisable to get good lumber standard wood for this purpose. It not only adds the beauty but also rigidity to the acoustic panel that we are creating. Mineral fiber insulation (2x 2’x4’x2”): It is highly advisable to NOT bring your eyes or skin in contact with the dust of the mineral fiber. Fabric: (cotton duck or burlap – about 72 inches long and 60 inches wide): It is always good to go for fabric with patterns and designs. Serrated blade or knife – this is a knife with a serrated edged blade, which is used to cut through tough surfaces. Well, I am also adding a video version of the process for your perusal. For reference, we are considering 2' * 4'. So, using a saw you need to cut the boards into a similar dimension. The top and bottom pieces should measure 2' while the sides should measure 4'. The size should be very accurate, and I recommend using a high precision measuring tape. For the further operation, you need to use a flat surface. Lay out the pieces on the surface. Using drilling machine make holes on the side pieces. Use the screw to tighten these holes. For added firmness, apply green glue. I will be sharing with you two methods of adding the insulation. Select the one that is feasible for you. Add small triangular wood pieces carved using the serrated blade as refurbishment at the four corners of the panel frame. Cut the board a bit bigger than the measurement of the frame. Add the wood glue around the panel and press the insulation hard against the wood. This is the final step. You can select a fabric as per your budget. If you are looking for cheap fabric, then I will recommend you to try burlap fabric or cotton duck material. You need to wrap the entire piece with the fabric, tuck in the extra edges and use the staple gun to secure the fabric covering. Remember, while doing this you should be taking extra care to make sure no wrinkles are made on the panel. Finally, when your work is done, hang up the panels using hooks or Z-clips. There isn't any doubt that the acoustic panels are one of the best ways to soundproof a room cheaply. I recommend you to take this DIY project as an important way to engage your family members. You can have loads and loads of fun by doing something that can protect you and your family against the health hazards caused by sound pollution. Are you ready for the DIY Acoustic panel project?